Related Series: Sasami Magical Girls Club Season 2, Tenchi Muyo! Notes: Spin-off of the Tenchi Muyo franchise. Not related to the previous Sasami magical girl series Pretty Sammy, despite sharing the character of Misao. Sasami Iwakura has been endowed with magical powers since birth; but at age three, she is forbidden by her parents to use them. So she decides to keep her magical powers a secret. But at the start of a new term, she encounters the new transfer teacher Washu and her pet Ryo-Ohki, and her life is about to change. The first series/season is dedicated to character development as we are introduced to magic girls Sasami, Misao, Makoto, Tsukasa, and An-an. As the girls discover their awakening powers, they also learn a bit about themselves as they train with Washu and Daimon as part of their "cooking club." This culminates in their taking a trip to the magic world, where they compete against other magic squad teams, some having boys in them. What a gigantic tease this series is. Imagine Sailor Moon, only instead of Usagi going around defeating the monster of the day with her tiara or wands, she used little sparkly dust. And she only fought monsters about 5 times in one season. That's my biggest problem with Sasami Magical Girls Club. The show makes you think that this will be about a group of grade-school girls learning to use their magic abilities, but it isn't. Instead it's a sappy, slice-of-life school drama of five girls who become friends because of the ability to simply wield magic. In short, if you're looking for magical girl action, look elsewhere. That takes a back seat to everything else. This wouldn't annoy me as much if it they didn't highlight each girl's individual power in the opening song. One girl, Makoto, has the ability to make herself grow or shrink, but this is only shown once in the first season, and in her debut episode. Another girl, Anri, has the ability to make words appear over people's heads by writing them down in a book, but that too is only shown in her debut episode. The same thing applies to Tsukasa as well, who has the ability to move via wind. Why bother giving these girls powers if you don't bother to show or use them? The only exceptions to the rule are Sasami and Misao, who get to use their powers at least a few times in the season. While we're on Sasami and Misao, let's talk about their characters. I don't care much for the "new" Sasami. While her cheerful, happy nature has been more or less retained, she's a lot louder, whinier, and brattier at times as well, which makes it hard to take her seriously as the leader of the group. Her actress was replaced in this series by 13 year-old Mana Ogawa, who fails to live up to her predecessor Chisa Yokoyama. (I blame the voice director and not the child actress, though.) Misao, instead of the shy, friendly girl she was in the Pretty Sammy material, is now a quiet girl who follows the Rei Ayanami school of acting. Her magical powers only form when she's depressed or scared, just to make her acute shyness more obvious. It would've been nice if 15 year-old Himeko Shimura was able to expand her voice more often, but she doesn't. The only other returning characters of Tenchi lore are Mihoshi, Ryo-Ohki, and Washu. Like in Pretty Sammy, Mihoshi is Sasami's teacher, only all the quirkiness she had in the former Sasami magical girl series has been sucked away. Ryo-Ohki is reduced to cameos at most after her appearance in episode 1, and her character design was changed for the worst. It's hard to explain, but she reminded me of Dumbo. Washu is the temperamental teacher of Sasami and friends, spending nearly half the series making them hone their powers on stupid stuff like flying a foot above the ground on brooms or shooting targets with shots from magical wands. Like everyone else from previous Tenchi series, her voice actress was replaced here, and not for the better. Akiko Hiramatsu voices her in this series, which would be great if Washu acted like Miss Yukari from Azumanga Daioh, but she doesn't. Washu is supposed to be fun, weird, and eccentric, and Hiramatsu's version of the character gets none of this right. Instead we get a watered down Washu with a bootleg Yukari voice. Her character is my least favorite aspect about this series, bar none. She also has an assistant who serves little more than a punching bag for her, especially when he hangs around Itoki, a ditzy, fairly endowed woman who refers to him as "Dai-chan" and hugs him quite often. Aside from these characters, we have Sasami's parents. At first they disapprove of her learning magic, especially her father, who has reasons he doesn't explain until the end of the season. Sasami also has the obligatory stock classmate friends, though they aren't as memorable as the quirky, funny classmates of hers from Magical Project S. There's also the obligatory rough-speaking boy, who has a crush on Sasami. But wait! Misao likes him too! Oh, I wonder how this goes down? A lame supporting cast isn't helped by annoying jokes that aren't all that funny. One recurring joke in the series is that Anri adores Tsukasa to the point of getting a nosebleed around her, which would be funny if Tsukasa even noticed her or had an emotion on her face that didn't make her look like a robot. Another tired joke is how Sasami is a lousy runner, pointed out in one episode by showing her sub-par running ability for what seems to be a couple of minutes, but feels several times longer than that. So if the show isn't about magical girl mishaps, what is it about? Friendship, pretty much. You know, like the kind of happy friendship messages they have in several other thousand anime. The magical girl aspect is just a gimmick for a mediocre story about girls becoming friends because of something special they all share. And while Sasami Magical Girls Club is not a bad series by any means because of it, it's not what I came in for. To be fair, there are some neat ideas in this series. It's nice for once to see a magical girl series where the girls obtain their powers and not all of a sudden become perfect at using them. It's also kind ironic that for once in a magical girl series, their uniforms actually weaken their magic instead of enhance it. (I couldn't have been the only one watching Sailor Moon and wondering why the girls suddenly obtain their powers by wearing skirts and boots.) The show also shows us that there are many different teams of magical girls and even boys from around the world as well, which is kind of neat. 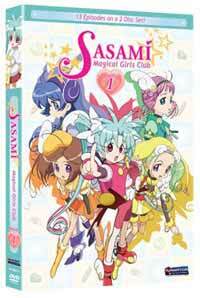 Unfortunately, a lot of the magical aspects of Sasami Magical Girls Club are either only briefly seen or mentioned. There aren't even any villains: the biggest "suspense" in the series comes from Misao nary missing a magical girl tournament to confess her feelings for a boy in her class, which she doesn't even get to do. The show was divided into two separate seasons from the start, and I can't help but feel that they purposely left in all the exciting bits for the second half. At least the art is good. Sasami and her magical girl attire look like crap, and Ryo-Ohki looks less like the cabbit she is and more like a rabbit with Dumbo ears, but that aside everything looks good. The colors are nice and vibrant, the animation's adequate, and most of the new characters look alright. The music is orchestrated but endlessly plays the same themes over and over again. In a rarity in anime, most of the children in this series are played by kids and young teenagers, which leads to mixed results at best. (Like I've already pointed out, I'm not a fan of Sasami's new voice.) Washu aside, the adult side of the cast is performed pretty good as well. Despite my numerous complaints about Sasami Magical Girls Club, I do admit that the show at times clicked for me. I wasn't all that thrilled at the lack of magical girl antics in a show that has the words "magical girls" in its title, but at least the main cast are likable enough. And in the rare time there is honest drama, it isn't nearly as overplayed as it is in Sailor Moon or Nanoha. At the same time, though, I wanted more action and intrigue. The season 2 preview at the end of the R1 DVD season 1 box set points at that, and I'm interested to see where this series goes. Until then, though, Sasami Magical Girls Club, in my opinion, is a harmless and gimmicky show that could use a little more magic and action and a lot less filler friendship moments. Recommended Audience: Would be appropriate for all ages if it wasn't for some chest-related jokes and Anri's affection for Tsukasa. It pushes an otherwise all-ages series to that for older children.